When I say "fancy stuff" what I mean is that, once you have that basic clawhammer banjo rhythm smoothed out, there are a few more important skills you must learn in order to play tunes and make music. I am deliberately keeping this very simple, as well I should, to give you the essentials in an easy, logical fashion. After you master these core concepts you will then be equipped to play unlimited tunes and music at your own direction. That is just a sequence of 4 notes, played on the first string. Play those with down-strokes of the right index finger. Just count steadily "1-2-3-4" and play each note along with your count. OK, that's not too hard to do. You can see we have backed up from the previous step to review in case you still didn't get that basic rhythm. Trust me here, I have taught quite a few people to do this (including some idiots such as myself!) and if you hang in there you WILL get it. That should look familiar! 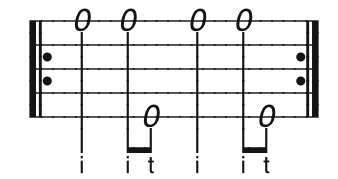 Of course that was the basic clawhammer rhythm you have been working on in Lesson 3. See, we have just been reviewing. Ah! This looks interesting! Notice the 2nd and 5th notes. You will see a stack of notes all lined up vertically. In TAB when notes appear vertically aligned it means you play them simultaneously. So those three notes, the 1st, 2nd and 3rd strings played open, constitute a quick strum called a "brush". The "b" under the stack of notes means brush. All you are really doing is making a wider stroke with your index finger and striking 3 strings together instead of a single string. Try that a bit. Perhaps even the 1,000,000 times which I suggest. What else do you have to do? Don't let that scare you. It is simply that basic clawhammer rhythm... with the brush stroke... and with a moving melody note which jumps from string to string. When you can play that with some decent accuracy move ahead. 1. Absolute accuracy in brushing EXACTLY those particular three strings (during the brush stroke) IS NOT NECESSARY! Sometimes you might only brush 2 strings, sometimes 4, sometimes only a single string. The brush is an OPTION. Do not flip out by worrying too much about precisely being able to only hit those three strings. Loosen up a bit, try to hit the first note clearly and without knocking into other strings and then on the brush, feel free to hit as many as you choose. 3. Get rid of your TV. It is the most sinister brainwashing device ever contrived and will do nothing good in your life. Simply tossing it out a nearby window, besides being fun in itself, will save you money, improve your feeling of self-worth, and improve your banjo playing which is, of course, my main concern here. Just be sure there is nobody walking along under your window when you chuck it out. That shouldn't seem to strange to you. 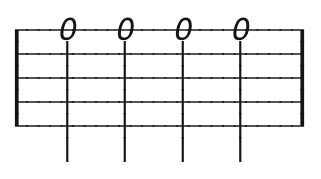 The only difference is that we will alternate between an open first string and playing a note at the 2nd fret of the 1st string. My suggestion is that you use the middle finger of your left hand, gently curled around the neck, to depress the 1st string just behind the 2nd fret. Again, a description in words is not as good as seeing this demonstrated in video so, if you are inclined, take a peek at my video course. Even watching the free demo videos might show you enough to get the idea if you are clever and tight for dough. Let me sidetrack a bit and explain why I keep mentioning the video course. Yes, I would hope you might consider purchasing it. I do this for two reasons: First, I know it works better as a teaching medium than this laboriously written text. Secondly, I make a little chump change every time someone purchases a video lesson and that keeps me in banjo strings, chicken feed and gummy worms to give to my 4 year old, soon to be banjo-pickin', son. I will not mention my reasoning again, mercifully for you. If you are one of those people who are able to figure this out from text and tab alone (as I did back in the '70s) I simply quote my philosophic idol, one Briscoe Darling, who said "More power to ya!" For those who wish to take advantage of the technological miracles offered by internet video and DVD instruction, I lay my video course humbly at your feet. If you play the tab shown above you can see that it combines a) that old basic claw rhythm, b) some moving melody notes on the 3rd and 2nd string, and c) frets a couple of notes with the left hand fingers. I suggest you play the 2nd fret notes using your middle finger and the 1st fret note with your index finger of your left hand. Again, go scope out my videos if you don't quite understand what's going on. I titled Step 4 "Fancy Stuff" and it is quite fancy compared with that basic rhythm in Step 3. But, there are 3 more techniques which are commonly used in clawhammer banjo. They are called the slide, the hammer-on, and the pull-off. I am not going to venture to teach those 3 essential techniques here in this online mini-course in clawhammer banjo. Those 3 techniques are covered so well in my video course that I don't want to even waste time trying to describe them using words. But, take heart, even without those techniques you can begin to play simple clawhammer banjo tunes. To prove this to yourself just move on to Lesson 5 and let's tackle a very simplified version of the banjo favorite "Cripple Creek." Ready? Let's go to Lesson 5!